Improve your skills and share your expirience! Follow treslines by email clicking Here! Currently i'm developing some android apps which needs to access a SQLite database and use basic CRUD (create, read, update, delete) methods. This tiny framework is showing to you how the design could be. 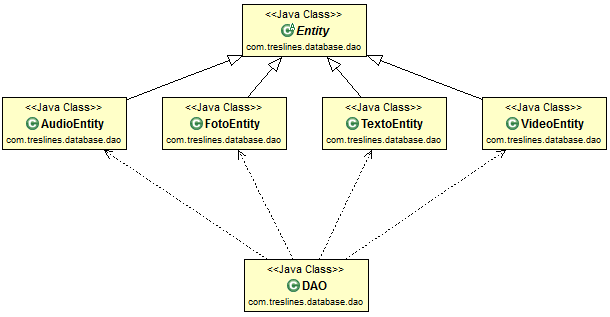 The main classes here are DAO (Data Access Object), DMO (Data Manipulation Object), Table and the enum DbConfig. DbConfig defines all database's configuration central in one location, which makes it simple to change something in case you need. The inner enums defines all the needed things associated with the tables you may need. It is responsible for configuration tasks. Table is abstract. All tables you may need extends from it making the implementation very simple. It is responsible for defining and creating tables. DMO is also abstract and contais all manipulation methods you may need. It is up to you to extend it in the way you want. Entity is a abstract class you may define to encapsulate common properties of the tables you may have in your application. It is responsible to hold the data readed from the database. 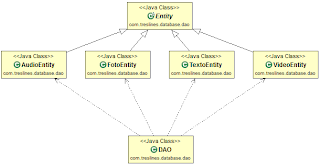 DAO is that class which accesses the database and populates the entities you've defined. Its responsibility is to access, read and return the entity you require. ClientTest here is just a JunitTest representing your Activity when it uses the DAO. I think the code is a better teller then words. For this reason lets take a look inside of it to understand the details. We will beginn step by step and the logical way we would start, when developing. Lets assume we know what we want. What's the first step? We define the tables. So lets start with the DbConfig and its inner classes. Now lets take a look inside of the abstract class Table. All tables we need will extend from it. OK done! we have our tables now. Lets see what DMO offers to us. This is the class which contains more logic inside. It is a very important class in this approach. It encapsulates all methods we may need. It is best to understand how SQLite works and what we are able to do with. * This Data Manipulation Object (DMO) offers CRUD operations (create, read, update, delete) and whatever you may need. The next class is the implementation of DMO. In my case i called it Database. In there i define some specific settings acc. to my needs like database name. Ok greate we are done for this part. Now lets take a look into the DAO. It will use the DMO to access the database and manipulate it. In this class you'll learn how to retrieve data from SQLlite. It is a good example if you are new on it. Good! In this simple example my concrete classes of entity are very simple. I has an empty body. For this reason i will show only one of it. Finally le's take a look inside of the DAO. That's also a very interesting class you should take a look inside of it. I develop an app which has all of its content stored in database.sql file. I've implemented a subclass of SQLiteOpenHelper and added database.sql to my project assets. Sounds interesting! May you have interess in share your expirience with us? I would publish here! I have also other approaches that i'll be publishing soon! Send your project (could be just a proof of concept) or if you prefer the whole project with some samples inside! Would be nice! Thanks! SQLite plays a powerful role as a tool in the Android developer's journey. There are various things to know about before proceeding to SQLite, data type and referential integrity is not maintained so need to take care of it properly. Hi, Thank you for nise sollution. Im new in java and android so i have a question. Method OnCreate in Helper id called only when database don't exist. How in this example will be create new tables? First of all, thanks for sharing. Only a thing, in ClientTest class, you has an error. You create an object for each ContentValues, but you only use "fotoRowToCreate" object to fill it. Later, you use the Database created for each Table object to make an insert of the same ContentValues object, the "fotoRowCreate" object. I understand is a copy&paste error. Application Engineer, Visionary and Ideologist for a better World.